This guest post is by John Foley, former lead solo pilot of the US Navy's Blue Angels. He is the founder and CEO of John Foley Inc., which provides keynote speaking, coaching, and hands on training services for Fortune 500 companies, professional sports teams, healthcare service providers and beyond. The core of his teaching is The Diamond Performance Framework, which translates the Blue Angels’ culture of excellence and peak execution for the World of Business. The ﬂying that I did with the Blue Angels was not dangerous, but it was inherently unforgiving, and nowhere was there less margin for error than “The Knife Edge Pass” maneuver. Imagine two jets headed straight for one another on a near collision course, 100 feet off the ground, closing in at 1000mph! As a pilot, it's your job to rotate your jet at the last split second, brushing past the opposing plane by a mere wingspan! 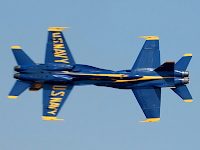 There is no room for improvisation, and Blue Angels master this routine by leveraging a very simple tool called CenterPoint Alignment. By brieﬁng on a CenterPoint, the two opposing pilots know exactly where to be, and exactly when to be there, and it’s this precision alignment that transforms the improbable into the possible. How many times in the Business world do we enter a meeting room with an investor, partner, or customer without being fully prepared and aligned with your team? In a Blue Angel environment, you would very quickly put yourself into a highly dangerous zone. Having the right set of information and sharing it between pilots is the ﬁrst step to getting aligned on a CenterPoint. When the two solo pilots attend a Blue Angel brieﬁng, they're given all of the necessary information, given the chance to visualize their actions, and mentally carry out the task at hand. Today, that's were Spoke comes in to play. Spoke.com is a great tool to help anyone collect the business information they need and get their team aligned around an information set, just like CenterPoint Alignment. Users scour the web to gather business insights on industries, trends, partners, customers and competitors, and create action-worthy intelligence to share with their team members. With these detailed industry maps, business users and teams understand where their CenterPoint is, and can fully align themselves along what needs to get done. When I speak about the Blue Angels, I'm speaking about the best of the best, about the top .01% of the top 1% of all pilots. Keeping your team aligned on various CentertPoints can be the difference between performing in the top 1%, and soaring with the top .01% in your industry. To learn more about John and his cutting-edge business philosophies, visit his website, or find him on Spoke.com.